Starbucks may have long prompted ridicule with its Italian-isms for "medium" (Grande) and "large" (Venti, or "20" in Italian) but it made no attempt to relieve the eye-rollers with its newly-announced size, rolling out beginning Tuesday in 14 states and in the rest of the country by May: the Trenta, a 31-ouncer. "Trenta" is Italian for "30." Starbucks has not yet explained why it couldn't call the size the more accurate "trentuno." But for that matter, the company has not yet explained "Tall." 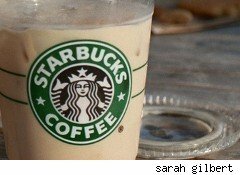 The size will only be offered in iced coffee, iced tea and iced lemonade beverages, allowing Starbucks to neatly skirt the obvious criticisms that the drinks might contribute to our nation's obesity crisis; even the sweetened versions, they say, can't be more than 230 calories. And as these are some of the least expensive drinks on the menu already, the company can't be criticized for raising prices even further -- the prices for the Trenta will be 50-cents more than the Venti. The biggest legitimate criticism comes from the National Post, which has printed a nice infographic showing that the Trenta (916 ml) is larger than the average stomach capacity (900 ml).So, it's clear that (as one jokester mentioned) Starbucks in the mostly-Southern states which will get the new sizes first -- Virginia, North Carolina, South Carolina, Georgia, Florida, Alabama, Mississippi, Louisiana, Texas, Oklahoma, New Mexico, Hawaii, Nevada and Arizona -- the major impact to the financial and physical health of its customers will be in their need to use the restroom. Let's not raise the alarm flags quite yet. However, it's one of those moves that certainly leaves the door open for future Trenta-sized beverages whose caloric content could end up rivaling the famously-retired Supersize sodas. At about 410 or 420 calories for a 42-ounce Supersize drink at McDonald's, many Venti beverages already outdo that number; the Caramel Brulee Latte is 430 calories, an Eggnog Latte is 610, and a Peppermint White Chocolate Mocha is 590. You and I can both do the math; even an "ordinary" flavored latte, in a 31-ounce size, would be about 500 calories; the sweetest versions of the drinks would be over 900 calories. Sure, it's just a little more ice and caffeine; and it's not like customers can't create drinks now that top 1,000 calories if they really want to. A soldier in my husband's unit would order a Venti mocha with five shots of vanilla; skinny, that ain't. But do we really need a reason to spend more than we already do on big plastic cups of caffeine and sugar? The answer to that is a resounding "no."